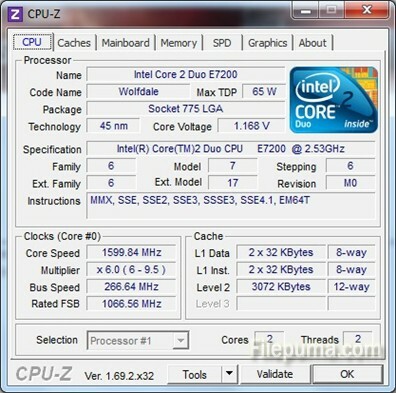 How to find all the data about your hardware with CPU-Z? You want to buy a new processor but you don’t remember what was the right socket on the motherboard? 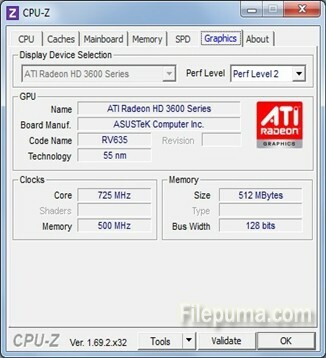 You want to see how much memory is your graphics card? Hold your screwdriver! You can learn all that and more with CPU-Z, a free software used by a lot of testers for its easy to use interface and the big amount of data you can pull with it. Step One: Go to Filepuma.com and click on the “Download Now” green button. 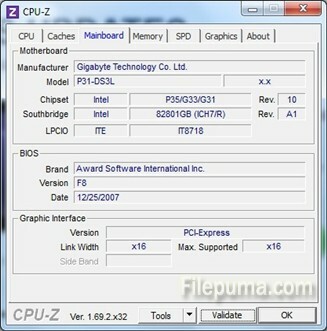 Step Two: As its name suggests, CPU-Z shows you all the data there is about your computer processor on the main window. On the third row of data you can clearly see the processor socket technology installed on the mainboard. So, if I want to upgrade to a new processor without changing the motherboard I have to look for a LGA compatible CPU. Of course, you can also see the processor’s core speed, bus speed and FSB (front side bus). Step Three: If someone asks you what motherboard you have you can answer in a blink of a second by clicking on the Mainboard tab on the upper side of the window. Step Four: We can go a little forward going to the graphics hardware. You can see the model, the technology, the memory installed and the frequency of the graphics card. If you have more than one card, you can select them from the first field, on the upper part of the screen. CPU-Z can also tell you things about the RAM memory, the slots they are installed on and the caches. It’s also extremely useful when you’re looking for drivers for them.